Atlanta Home Modifications, LLC recently completed the design and installation of a 100′ ramp for a family in Cobb County, Georgia. 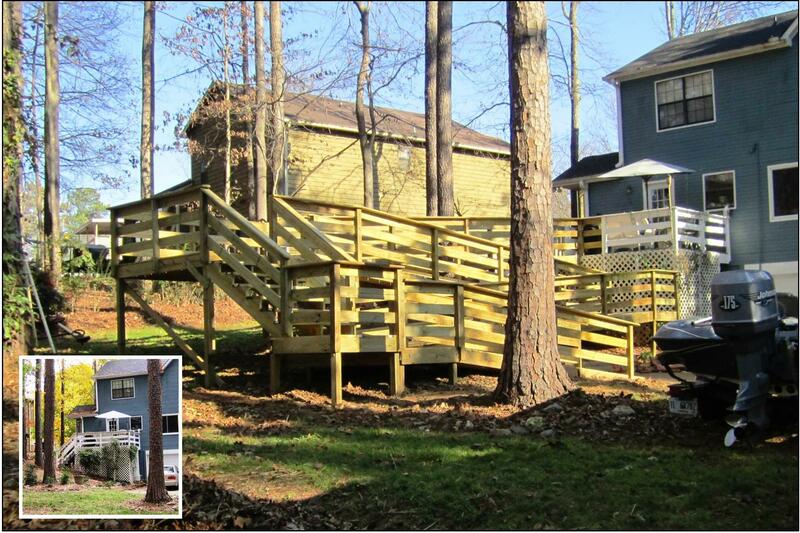 The wood ramp includes 100 lf of sloped ramp, two 4’x8′ platforms, an 8’x10 platform, and a stair. The stair enables pedestrian traffic to walk from the driveway up to the back door, bypassing two ramp runs. If you are experiencing a disability and cannot access your home due to steps, contact Atlanta Home Modifications for an in-home accessibility assessment. We will evaluate the circumstances of your home, and provide accessibility solutions, including cost estimates. Please call us at 770.880.3405, or visit the Atlanta Home Modifications website. Is a Wheelchair Ramp or a Vertical Platform Lift (VPL) a Better Choice for Your Home?